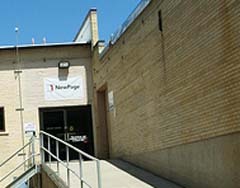 Hundreds of workers at a Kimberly paper mill will lose their jobs later this summer as NewPage Corp. closes a plant there. Employees got the news Wednesday morning. NewPage Senior Vice President of Operations George Martin said 125 layoffs announced at the beginning of the year couldn&apos;t make up for a loss in orders. "The demand for our product has fallen off, at an unprecedented rate." Martin says closing the plant, with its 475 jobs, was a business decision. Andy Nirschl is the union president of United Steelworkers Local 2-9, and says NewPage doesn&apos;t care about the workers. "To them, it&apos;s just a piece of their assets that they can shut down, to try to get more market share." Even though there had been rumors that the mill might close, NewPage employees in Kimberly were surprised by the announcement. Nirschl says its going to be difficult for workers to find new jobs. Martin says one of the mill&apos;s paper machines will be shut down in the middle of August and the other one will go down around the end of the month. "Employees would continue to be paid until the end of September, at which point the rest of their benefits package would kick in, for reverence," he says. NewPage bought the mill from Stora Enso late last year, and Martin says the company had no plans to close the plant at that time.